My first earnings short-squeeze trade idea is water management and road infrastructure products and services provider Lindsay (LNN - Get Report) , which is set to release numbers on Thursday before the market open. Wall Street analysts, on average, expect Lindsay to report revenue of $148.43 million on earnings of 99 cents per share. The current short interest as a percentage of the float for Lindsay is extremely high at 28.9%. That means that out of the 10.45 million shares in the tradable float, 3.02 million shares are sold short by the bears. If the bulls get the earnings news they're looking for, then shares of Lindsay could easily trend sharply higher post-earnings as the bears rush to cover some of their positions. From a technical perspective, Lindsay is currently trending below both its 50-day and 200-day moving averages, which is bearish. This stock has been downtrending over the last three months, with shares moving lower off its high of $78.72 a share to its recent low of $65.78 a share. During that downtrend, shares of Lindsay have been making mostly lower highs and lower lows, which is bearish technical price action. If you're bullish on Lindsay, then I would wait until after its report and look for long-biased trades if this stock manages to break out above its 200-day moving average of $70.27 a share and its 50-day moving average of $71.63 a share with high volume. Look for volume on that move that hits near or above its three-month average action of 122,229 shares. If that breakout materializes post-earnings, then this stock will set up to re-test or possibly take out its next major overhead resistance levels at $73.60 to $75.60, or even $78 to $79 a share. 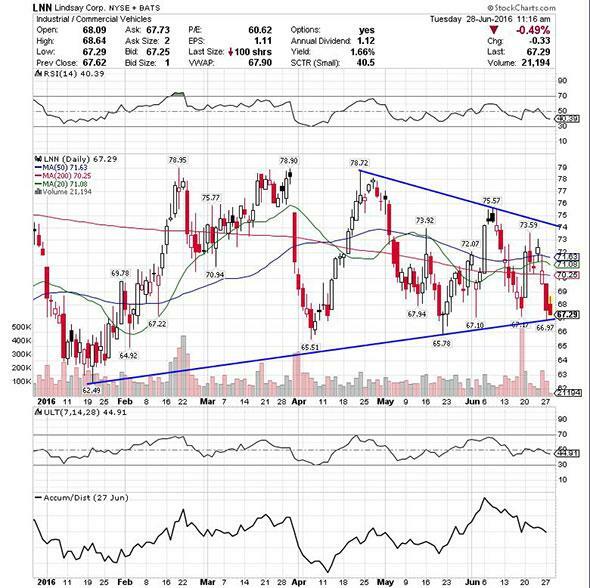 I would simply avoid Lindsay or look for short-biased trades if after earnings it fails to trigger that breakout and then drops back below some key near-term support levels at $66.97 to $65.78 a share and then below more support at $65 a share with high volume. If we get that move, then this stock will set up to re-test or possibly take out its next major support level at its 52-week low of $62.99 a share. Any high-volume move below $62.99 will then put a move below $60 into play for shares of Lindsay. Another potential earnings short-squeeze play is full-service restaurants owner and operator Darden Restaurants (DRI - Get Report) , which is set to release numbers on Thursday before the market open. Wall Street analysts, on average, expect Darden Restaurants to report revenue $1.82 billion on earnings of $1.08 per share. The current short interest as a percentage of the float for Darden Restaurants is pretty high at 11.2%. That means that out of the 126.11 million shares in the tradable float, 14.14 million shares are sold short by the bears. The bears have also been increasing their bets from the last reporting period by 4.8%, or by about 652,000 shares. If the bears get caught pressing their bets into a strong quarter, then this stock could easily soar sharply higher post-earnings as the bears rush to cover some of their trades. From a technical perspective, Darden Restaurants is currently trending below both its 50-day and 200-day moving averages, which is bearish. This stock has been trending sideways over the last four months, with shares moving between $60.98 on the downside and $68.68 on the upside. Any high-volume move above the upper-end of its recent sideways trending chart pattern post-earnings could trigger a big breakout trade for shares of Darden Restaurants. 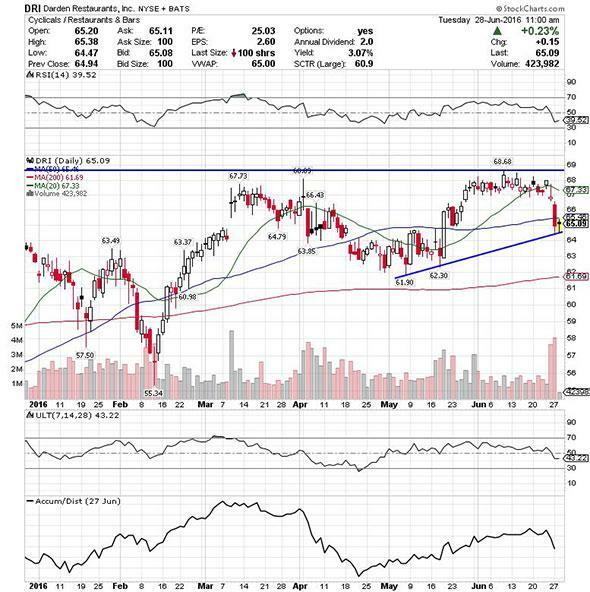 If you're in the bull camp on Darden Restaurants, then I would wait until after its report and look for long-biased trades if this stock manages to break above some near-term overhead resistance levels at its 50-day moving average of $65.46 a share and its 20-day moving average of $67.33 a share and then above its recent high of $68.68 a share with high volume. Look for volume on that move that hits near or above its three-month average volume of 1.86 million shares. If that breakout develops post-earnings, then this stock will set up to re-test or possibly take out its 52-week high of $75.60 a share. I would simply avoid Darden Restaurants or look for short-biased trades if after earnings it fails to trigger that breakout and then drops back below some key near-term support at $64 a share with high volume. If we get that move, then this stock will set up to re-test or possibly take out its next major support levels at $62.30 to $61.90, or even its 200-day moving average of $61.69 to $58 a share. Another potential earnings short-squeeze candidate is staffing and outsourcing services player Paychex (PAYX - Get Report) , which is set to release numbers on Thursday before the market open. Wall Street analysts, on average, expect Paychex to report revenue of $751.52 million on earnings of 49 cents per share. The current short interest as a percentage of the float for Paychex stands at 5.6%. That means that out of the 321.53 million shares in the tradable float, 18.17 million shares are sold short by the bears. The bears have also been increasing their bets from the last reporting period by 1.3%, or by about 232,000 shares. If the bears get caught pressing their bets into a strong quarter, then this stock could easily spike sharply higher post-earnings as the bears scramble to cover some of their positions. From a technical perspective, Paychex is currently trending above both its 50-day and 200-day moving averages, which is bullish. This stock is starting to trend back above its 20-day moving average of $54.92 a share on Tuesday right in front of their earnings report. This spike over the 20-day is now starting to push shares of Paychex within range of triggering a big breakout trade post-earnings above some key near-term resistance. If you're bullish on Paychex, then I would wait until after its report and look for long-biased trades if this stock manages to break out above its new 52-week high of $56.30 a share with high volume. Look for volume on that move that hits near or above its three-month average action of 1.86 million shares. 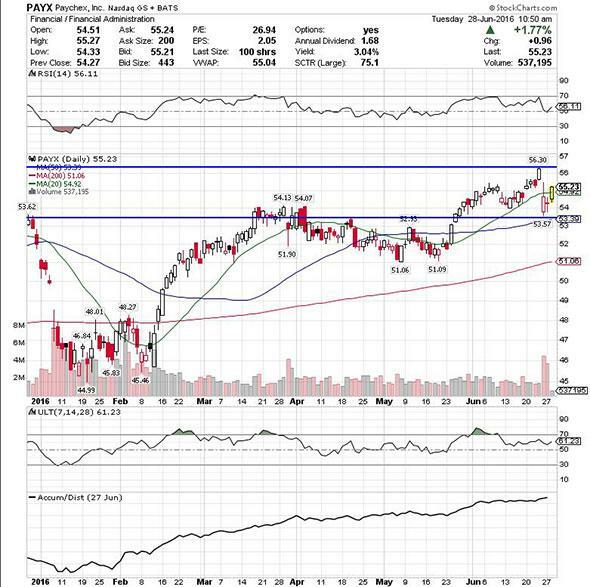 If that breakout takes hold post-earnings, then this stock will set up to enter new 52-week-high territory, which is bullish technical price action. Some possible upside targets off that move are $60 to $65, or even $70 a share. I would avoid Paychex or look for short-biased trades if after earnings it fails to trigger that breakout and then drops back below some near-term support levels at $53.57 to its 50-day moving average of $53.39 a share with high volume. If we get that move, then this stock will set up to re-test or possibly take out its next major support levels at its 200-day moving average of $51.06 to $48, or even $46 a share. Another earnings short-squeeze prospect is basic materials player Schnitzer Steel Industries (SCHN - Get Report) , which is set to release numbers on Thursday before the market open. Wall Street analysts, on average, expect Schnitzer Steel Industries to report revenue of $356.41 million on earnings of 18 cents per share. The current short interest as a percentage of the float for Schnitzer Steel Industries is notable at 10%. That means that out of 149.07 million shares in the tradable float, 15.01 million shares are sold short by the bear. From a technical perspective, Schnitzer Steel Industries is currently trending below both its 50-day and 200-day moving averages, which is bearish. This stock has been consolidating and trending sideways over the last two months, with shares moving between $14.83 on the downside and $17.86 on the upside. Any high-volume move above the upper-end of its recent sideways trending chart pattern post-earnings could trigger a big breakout trade for Schnitzer Steel Industries. If you're bullish on Schnitzer Steel Industries, then I would wait until after its report and look for long-biased trades if this stock manages to break out above its 200-day moving average of $15.78 a share to its 50-day moving average of $17.37 a share and then above more key resistance levels at $17.71 to $17.86 a share with high volume. Look for volume on that move that hits near or above its three-month average volume of 442,388 shares. If that breakout develops post-earnings, then this stock will set up to re-test or possibly take out its next major overhead resistance levels at $19 to $19.50, or even $20.50 to its 52-week high of $21.57 a share. I would simply avoid Schnitzer Steel Industries or look for short-biased trades if after earnings it fails to trigger that breakout and then drops back below some key near-term support at $14.83 a share with high volume. If we get that move, then this stock will set up to re-test or possibly take out its next major support levels at $13.22 to $12.48, or even $12 a share. My final earnings short-squeeze trading opportunity is semiconductor systems provider Micron Technology (MU - Get Report) , which is set to release numbers on Thursday after the market close. Wall Street analysts, on average, expect Micron Technology to report revenue of $2.96 billion on a loss of 9 cents per share. The current short interest as a percentage of the float for Micron Technology is notable at 6.1%. That means that out of the 1.03 billion shares in the tradable float, 63.69 million shares are sold short by the bears. The bears have also been increasing their bets from the last reporting period by 1.9%, or by about 1.21 million shares. If the bears get caught pressing their bets into a bullish quarter, then this stock could easily rip sharply higher post-earnings as the bears rush to cover some of their positions. From a technical perspective, Micron Technology is currently trending above its 50-day moving average and just below its 200-day moving average, which is neutral trendwise. This stock has been uptrending strong over the last two months, with shares moving higher off its low of $9.35 a share to its recent high of $14.16 a share. During that uptrend, shares of Micron Technology have been making mostly higher lows and higher highs, which is bullish technical price action. That move has now pushed this stock within range of triggering a big breakout trade post-earnings. 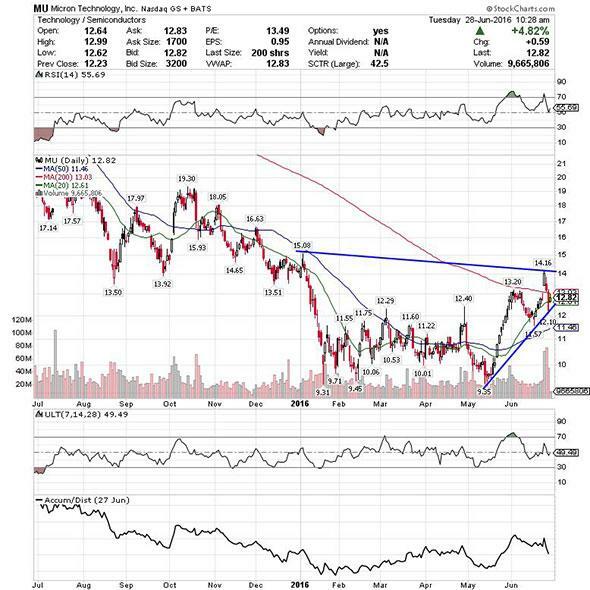 If you're in the bull camp on Micron Technology then I would wait until after its report and look for long-biased trades if this stock manages to break out above its 200-day moving average of $13.03 a share and then once it clears some key resistance levels at $14.16 to $15.08 a share with high volume. Look for volume on that move that hits near or above its three-month average action of 27.60 million shares. If that breakout fires off post-earnings, then this stock will set up to re-test or possibly take out its next major overhead resistance levels at $16.63 to $18.05 a share. 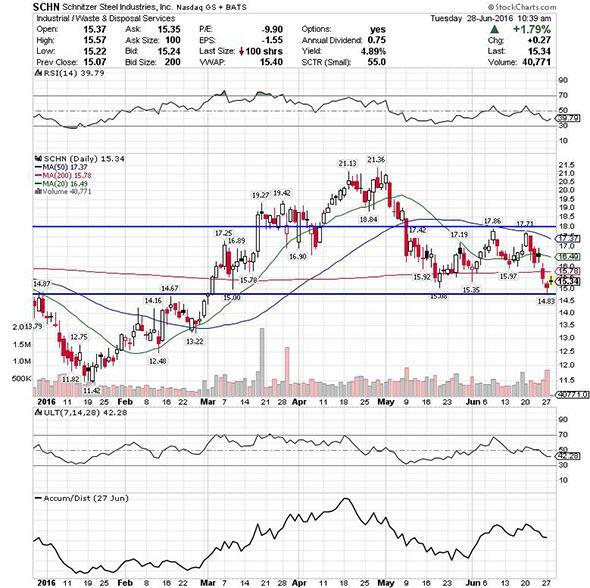 I would avoid Micron Technology or look for short-biased trades if after earnings it fails to trigger that breakout, and then drops back below its 20-day moving average of $12.61 a share to some more near-term support at $12.10 a share with high volume. If we get that move, then this stock will set up to re-test or possibly take out its next major support levels at $11.57 to its 50-day moving average of $11.46, or even $10 to $9.35 a share.